Why wait an hour or more, when you could enjoy the same texture and flavor in a matter of minutes? 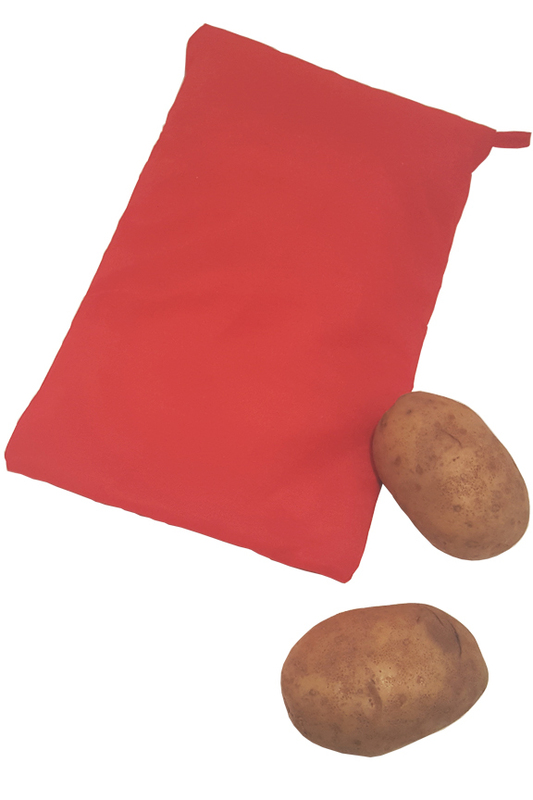 This microwavable pouch offers one of the fastest and most effective ways to bake a potato in your microwave, and it's incredibly easy to use. 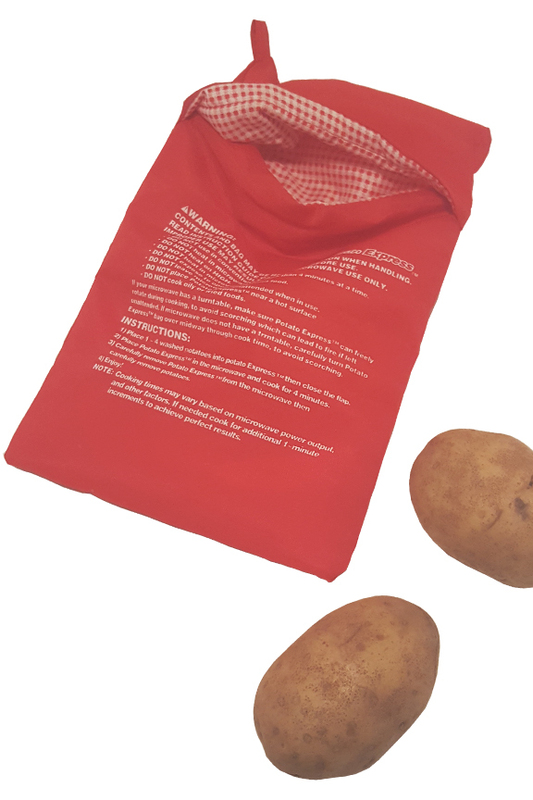 Steam will collect within the pouch to build up heat, and cook your potato to perfection. Once finished, the thick, insulated material will also keep it warm for up to an hour. It works with any type of potato you prefer, and it even cooks yams, corn, asparagus and other vegetables too. Just place washed food inside the chamber, stick it in your microwave, and heat for the few minutes necessary. Your favorite vegetables will be thoroughly cooked, and ready to eat. The reusable bag features an advanced layer of insulation that locks in steam while cooking, and it retains warmth afterward to maintain warmth until you're ready to serve. It's compatible with any microwave, and it comes complete with a handy loop for hanging to make storage simple. Stop skipping your favorite side dish because it takes too long to finish, but don't settle for the under-cooked, and inconsistent results that other products and techniques offer. Achieve delicious, oven baked quality in a fraction of the time with this high quality alternative. Versatile. Perfect for red white or yellow potatoes, but also great for sweet potatoes, corn, carrots, broccoli, etc. Fast. There is no faster way to bake a potato that offers the same level of results. Quickly cook all the way through without ruining the delicious flavor and texture you love. Easy. Simple steps and a clever design ensure that anyone can use it without error. Reusable. Other options are disposable, but this one can be used over and over again. Healthy. Quickly steam your favorite vegetables and retain valuable nutrients. Make it easier to enjoy fresh vegetables without planning or taking a long time. Quality. Other cookers don't work as well due to inferior designs or low quality materials. This one has been tested, and it is proven to work well. Double Duty. The perfect container for cooking, but also useful as an insulated pouch to keep cooked food warm for up to an hour. This product is incredibly easy to use, and the results are outstanding. You can quickly prepare a baked potato that rivals one from your oven, or one you might pay for at a restaurant, and there is very little room for error. The steps below will detail the simple process for cooking a potato, but you can also use a modified technique to cook other foods like corn on the cob, broccoli, cauliflower, asparagus, carrots, green beans, squash and more. The fast and effective technique will retain nutrients and the addition of the steam will help to maintain flavor and prevent drying. Wash your spud(s) thoroughly and leave wet. Puncture several times with a fork and then place inside the pouch. As an option that may improve results, wrap with wax paper or parchment paper prior to putting inside. Heat on high using the chart below. Times listed are for potatoes, so adjust accordingly for other veggies. Once finished, allow a few minutes to cool prior to removing food from the pouch. If not using right away, keep inside to maintain warmth for up to an hour. Hand wash when necessary for cleaning. Hang by loop or place in cabinet or drawer for storage. Many of us avoid healthier foods due to the perceived difficulty in preparing them. Nobody wants to spend a bunch of time, or dirty a bunch of dishes, and few of us care to even turn on the oven. This microwavable pouch eliminates the guess work, reduces the time, and all but guarantees results. You won't have to turn on your oven or your stove, and in many cases the vegetable you prepare will be more beneficial because vital nutrients won't leech or bake away. The fast cooking times and lack of submersion means that all of the good stuff will still be in your food for you to enjoy, and no vitamins will float away in water or cook away due to excess heating. When you add in the fact that ist also doubles as a warmer, this product would make a valuable addition to any kitchen, and it will be especially useful to single folks, young families, busy professionals and others that want to simplify the cooking process, or save time. Uses Cook or keep warm alomst any type of vegetable. Perfect for potatoes, but also great for other foods too. Compatibility Works in any microwave. Time will vary based on power and other factors. Capacity Works with one or two average to large size bakers. A great way to steam spuds, and enjoy oven baked flavor within a matter of minutes. Ideal for any kind of potato, but also useful for other foods. A quick way to prepare delicious side dishes. Order Yours Today! This is great for baking potatoes, which used to take 1 hr. in my toaster oven. White potatoes take longer than sweet potatoes, generally. And you have to cook them a little longer than the directions tell you. But I love a good baked potato, and this is a great help. Got my new microwave potato baking bag & it's wonderful. No more soggy or tough skin which is a part I enjoy. Glad to have it! The micro-wave potato cooker works great, cooking the food quickly and thoroughly. The directions say not to heat on high but don't say at what level you should heat at. So my question is what level do you use to cook? Start with a medium setting, and then adjust as needed. All microwaves vary, so there is no perfect temp to set it at for all users. How long do nuke an ear of sweet corn? For a single ear, start with 2 minutes and adjust as necessary to perfect the time needed for your specific microwave. 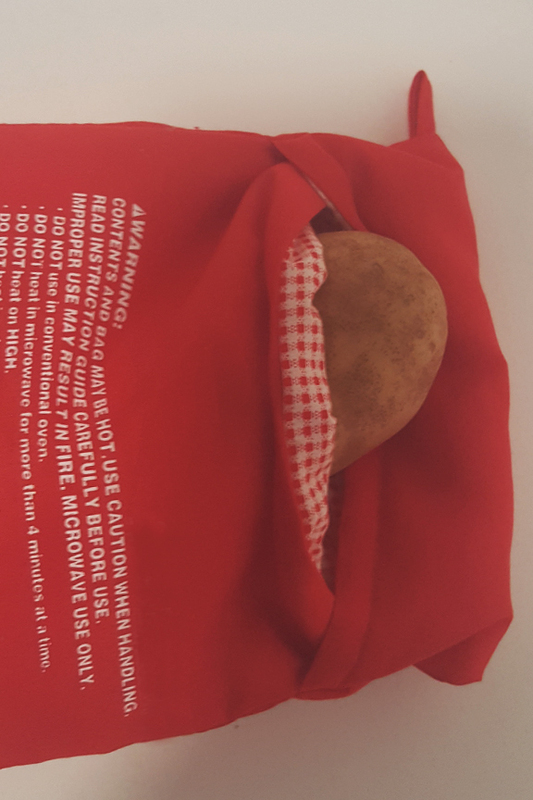 How do I clean the potato express pouch? For best results, hand wash and then hang to dry when necessary. What about scorching or burning? Neither is really an issue when using this pouch. Do you need to wrap your vegetables in wax paper like you would for the potatoes? That step would be totally optional, but it may improve results for certain foods. Why do the skins of the potatoes, whether white or yams, get tough and hard to cut? This is not normal. Try a lower heat setting, and adjust cooking time if necessary. 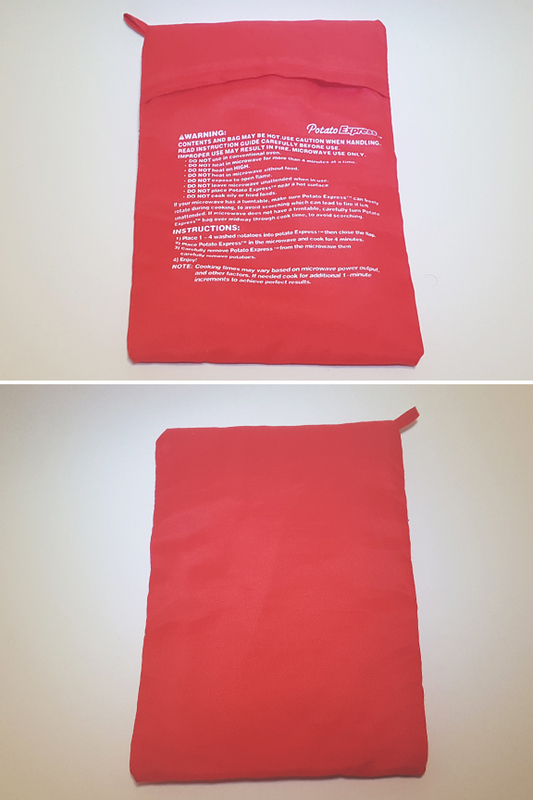 I washed the pouch, can I use it even if it isn't dry? MicroBuddy - A 17 piece microwave cooking set. A Balloon Style, Silicone Coated Whisk. A Safer Way To Stir. Includes a Spatula, a Brush and a Scoopatula. A Pasta Measuring Tool and Spaghetti Fork in One. A Quick and Easy Way To Make Perfect Poached Eggs.